Alex Prunty Racing: Alex Matches Best Career SLM Finish of 3rd in Back to Back Races at DRP with TUNDRA SLM Series! Alex Matches Best Career SLM Finish of 3rd in Back to Back Races at DRP with TUNDRA SLM Series! 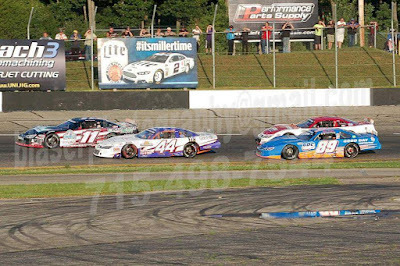 WISCONSIN DELLS, Wis. (July 18, 2015) â€“ â€œHe made one mistake, he went high in turns one and two and I got underneath him and I was just trying to be smooth and stay calm and I was able to make the passâ€ said Ty Majeski on his battle for the lead with Dalton Zehr. At the site of his first Late Model victory, Ty Majeski did it again Saturday night, earning a second straight TUNDRA Super Late Model Series victory at Dells Raceway Park, the birthplace of TUNDRA in Round Four Powered by Wisconsin Potatoes. Things got off to rocky start coming out of turn two on lap five. At least nine cars were involved in some fashion. Performance Diesel Fast Qualifier Brian Hakala was involved and left on the hook as well as Dan Lensing, Maxwell Schultz and Bobby Kendall who all sustained major damage. All drivers were physically okay after the incident. Following a red flag for cleanup, which also included a water break for drivers on a day where temperatures hung around ninety degrees, the green flag flew again to begin the 70 laps that remained. The front row for the restart remained the same as the original start five laps earlier with Deans Satellite and Security Rookie of the Year contender Cole Anderson on the inside and defending TUNDRA champion Dalton Zehr to his outside. Cole Anderson made fairly quick work of Zehr who quickly was under pressure from Majeski for second. Meanwhile, Alex Prunty made his way into fifth past Rich Schumann Jr. and began to track down Ryan Farrell for the fourth position. Fifteen laps into the race Majeski got to the back bumper of Anderson and began to pressure for the lead. Zehr got back to Majeskiâ€™s bumper and the top three ran nose to tail as they checked out from the rest of the field. Prunty made the pass on Farrell via the inside line and began to track down the top three as Anderson, Majeski and Zehr seemed to be content riding nose to tail for the time being. Majeski began to work Cole Anderson for the top spot at lap 35. As the battle up front intensified with Majeski trying to find a hole on the inside, a few more cars joined the scrum at the front. Michael Sauter, Ryan Farrell and Mike Lichtfeld made it a seven car train at the front all nose to tail. Lichtfeld, who caught a piece of the incident on lap five and sustained some right front damage, seemed to have a very strong car making passes on the inside and outside as he battled back to the front after the early red flag. Lichtfeld worked past Sauter for sixth position with 28 laps to go and then got by Farrell for fifth the following lap. The top four of Anderson, Majeski, Zehr and Prunty again began to pull away. With 25 laps remaining Majeski took a look inside Anderson and made very slight contact which allowed Dalton Zehr to get to Majeskiâ€™s outside and shortly thereafter cleared Majeski and started to work to Andersonâ€™s outside. Zehr nosed ahead to lead lap 51 by a nose. Lap 53 rolled around and Zehr was able to clear Anderson as Majeski was next to try Anderson from the outside. With Zehr trying to pull away, Majeski knew he had to make quick work of Anderson to have a shot at Zehr. With 19 laps to go Majeski was able to clear Anderson. Zehr had built up a half-a-dozen car length lead on Majeski, but he wasnâ€™t going to quit. Shortly after Majeski cleared Anderson, Prunty snuck by for third followed by Lichtfeld gaining the fourth position. With ten laps to go it was obvious that Majeski was gaining ground on the leader. The next lap he was a half of a car length off Zehrâ€™s bumper. With eight laps to go Majeski took a look inside Zehr in turns one and two. The leaders battled side by side for two laps with Majeski finally prevailing on the inside line and began to run away. Zehr was left to fend off Alex Prunty for second as Ty Majeski ran off to win his second straight Dells Raceway Park TUNDRA feature event. Zehr was able to keep Prunty at bay to record a second place finish and Prunty, in his first TUNDRA start, finished third followed by Mike Lichtfeld. 8- 45 Jim Sauter Jr.
14- 54 Rich Schumann Jr.